Aaand we’re back! Sorry, guys, but I updated too frequently with those DFWCon posts. It drove me a little crazy. But the last few weeks have been a good break, so now I’m ready to wrap up what I learned back in April. 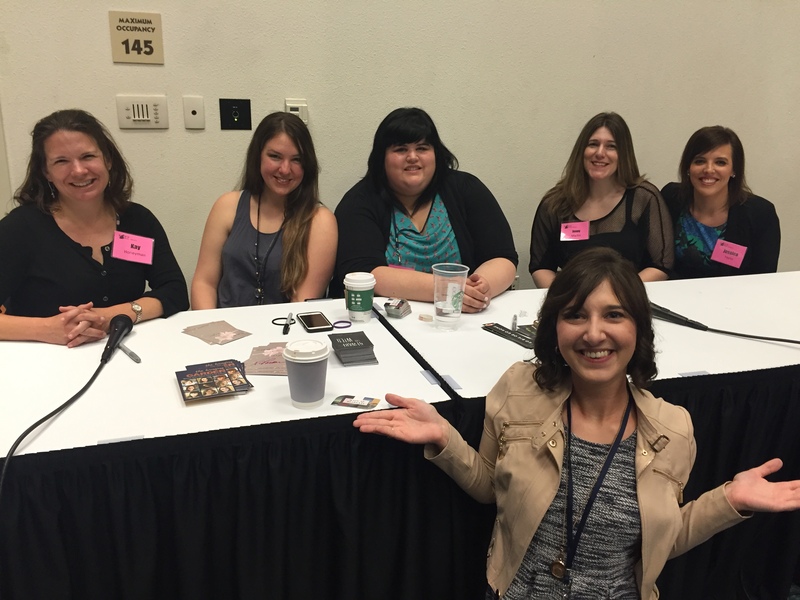 The YA panel was probably my favorite one, with the exception of Diversity in Writing. Five lovely YA authors spent the whole hour talking about how they were published, and answering questions for us hopefuls. YA is the best genre. First reason? It’s an umbrella genre. If you’re a romance writer, you’ve pigeon-holed yourself into writing romance forever. If you switch to sci-fi, your romance readers probably won’t follow you. Not true with YA–kids will read anything as long as the story is solid. Second reason? The audience. Teens and tweens are, as these authors described, “rabid” about their favorite books. That’s why all the most popular novels (Harry Potter, Hunger Games, Twilight, etc) are YA. These kids ship your characters. They have conspiracy theories. They share the books with everyone, friends and adults alike. And they make a point to show up to your signings. The raw enthusiasm of these young readers keep the panelists solidly in YA. Word count matters, especially in a debut novel. If no one knows you, agents won’t take chances on books that are too long / short to sell. So if you’re a debut, but you think your fantasy epic NEEDS to be 200,000 words… here’s a hint. It doesn’t. Instead, slim it down. A good YA is 60,000 – 80,000 words, depending on subgenre. Sci-fi and fantasy can go a little higher, but NO MORE than 90,000. Even 90k will be a tough sell. Remember, it’s easier to build on a shorter novel than slim down a long one. Publishing is a slow process. Getting an agent is just the beginning. One of their novels–“Beware the Wild” by Natalie C. Parker–sold overnight to a publisher. But even then, it took her and editor 9 months of solid editing to get it print-worthy. Chapter length is a personal preference. It’s all about pacing here. They gave a rough estimate of 2,000 words, but that’s all subject depending on how your novel works. Scenes should open with a thesis, of sorts, and end with a strong forward motion. If you’re floundering with a scene, it probably needs to be reworked or scrapped. Finding an agent is easy… with the right project. Here’s the kicker. Not every book is perfect for the world. One of the authors finished a novel she was sure would sell overnight, and shopped it for a year before giving up. Then she researched the market and trends, wrote a new book accordingly, and sent it to her top ten agents. Within days, she had several offers of representation–but it took the right novel. So if you’ve been querying a while, it may be time to step back from your prized book and work on something new. All you need is one novel to be your big break! Once you find an agent, it’s OK to leave them. Here was the biggest secret of the day. Of the five panelists, THREE had left their first agent. There’s a stigma in the industry that it’s one and done. But the fact is, if your agent isn’t getting you where you want to go, it’s time to look elsewhere. And that’s okay. It’s actually super common; sometimes an agent is overly helpful, and the author prefers to work alone. Sometimes it’s the opposite. Sometimes an author wants to be in bookstores, but the agent only has connections with indie publishers. If your goals aren’t aligning, it’s okay to leave. Just be polite about it! Here’s a tip to avoid this entirely: DO YOUR RESEARCH. Investigate all potential agents thoroughly. Interview their clients, especially PAST clients, since they’ll probably have solid reasons for leaving that agent. Any agent worth her weight will provide a client list before you sign with her, if you ask. So definitely ask! Whew. As I said, this was a goldmine of information. These lovely ladies were incredibly knowledgeable about the YA field. And what was interesting is that every single one of them was plucked from the slush pile. So yes, folks, it really does work! Ekans hat. All the rage in PHX. Okay. This is right around when I had to leave to catch my plane, so there you have it. This was my DFWCon experience! If you’re looking for the other panels I took, check out my past posts. I touch on just about everything there! Are you a YA writer? If not, would you consider trying it out? Let me know in the comments below!